My fave fix-it guy, Makis of FixMyWP and I have both been working overtime on massive cleanup and security projects for a few clients. One of my clients had who knows who doing things on her sites that created the biggest messes either one of us had ever seen. I don’t know how much it cost to get them into that shape, but I’m positive it cost more to do that and then have to fix them than it would have cost to hire a pro to do them right in the first place. And another client moved over from Bluehost to A2 and we are coming to the end of stripping out all of the leftover code Bluehost had in there, including some scary files for remote access at a command line level. I know me and the site owner are definitely breathing easier knowing all that is taken care of and the sites are all secure now. Last month I finished with my parts of major site revamps and now the clients are working on their parts. Some of those are in sandbox sites happily working with their designers and making super progress. Some are continuing to switch out resource hog or old plugins for better ones so we can move up to PHP7. And some are in the process of having all their old images optimized in bulk. And a few others have started their DIY SEO courses. So, when we do a site audit and find a bunch of stuff that needs fixing, it’s not all me being hired to do it. There are plenty of things that the site owners can do for themselves and at their own pace too. Getting educated about your site up front is worth every minute and every penny you spend. Just ask any of the folks in my training classes. They are going to not only make money with their sites, they are not going to suffer the expensive pitfalls of learning the hard way. And their design process is a breeze and way the heck cheaper too. The design process is fast, stress-free, and cheap too because everybody is very clear on what is to be done and why and my designers don’t have to build 14 versions until the client makes up their mind what they want. They hit the SEO ground running so hard they have to hold their hats. Everything is right from the get go and all they have to do is get busy sending traffic to the site with social media and such. These folks are going to make money with their sites. How do I know that? By watching my previous training clients do it. Poor A2 Hosting suffered a massive DDoS attack since the first of August. I believe it has ended. Now A2 has good mitigation service for things like this, but when the tidal wave is a tsunami, even the biggest ships get rolled under. I’m sending the support folks a lot of love and good vibes, as I’m sure they haven’t slept or eaten much since this started and all hands were on deck until it was resolved. I also know exactly how angry and belligerent site clients can be when major disruptions happen. There’s nothing fun about being in support anyway, and times like this are especially stressful. When your hosting company is in distress, it’s a good idea to lay off major site changes as much as you can. The interruptions could glitch a backup or update. I’ve seen site owners leave a hosting company in droves when things like this hit. In fact, I saw a lot of folks leave their EIG owned hosts like HostGator and A Small Orange over things like this, and jump over to A2 or SiteGround or others. These amplified botnet hackers pick a target and cripple it. I’ve seen every host I’ve worked with get hit like this every couple of years. All I can say is there is nowhere to hide if you want to stay with a big box host. The other choice is to move to smaller, more expensive boutique hosting where they can set up extreme country blocking and such. Or, get a super expensive dedicated server of your own and set it up that way too. But even that may not save you from a DDoS attack. Those hacker targets can be specific sites, hosting companies, or even the internet hubs themselves where traffic is routed. When they hit a hub, it can disrupt access to a nearby hosting data center and there is nothing the host can do about it because they are not the ones under attack, the nearby hub is. Think of it like major airports. When Chicago is snowed in then L.A. and N.Y. airports get bogged down too, even though they have no problems. Of course, you could go to cloud hosting, but that has several other disadvantages too, like being slower overall. So, I think I’d rather put up with an infrequent DDoS attack of this magnitude, than slower and other issues every day. But that’s me. Because these attacks are so radically disruptive to commerce, I wish there were an international organization with some real funding and real teeth to find and prosecute the hackers behind such things. But, it’s very much like copyright laws. They really break down when so many countries are involved, especially those that don’t have the resources to really police such things. Needless to say, the attacks on A2 have disrupted my work schedule, as my sites are there, as are many of my clients’ sites. Webmaster Training HTTPS tutorial updates from the findings I made in the last two weeks with that redirect fluke. I have a new order for the conversion checklist too. WP Rocket tutorials and posts for both the public and Webmaster Training. I actually had the whole weekend set aside to complete a couple of those, but oh well, move along, right? I’m still able to conduct the caching tests I had started over at SiteGround on my testing account there. I’m digging into their server-side caching. And then combining that with WP Fastest Cache and CloudFlare. Those tests take time, not the least of which is waiting for the cache to build or purge and then running new tests or waiting for the domain to propagate when put back and forth on CloudFlare. So, I can do a little, and then have to take a break and go do other things while it’s working in the background. I hope to have results for you in the coming weeks. Right behind these current tests I’ll be doing WP Rocket caching tests on this test account, as SiteGround has an unusual Apache/nginx setup and I want to see how to setup WP Rocket for that. I’ve also been going full steam ahead with creating 3 new webinars that will launch later this month. These will be for WHM accounts where you can have multiple sites, all in their own cPanels. The first webinar will be free and open to the public. We’ll take a tour of a WHM account and cover what it can do. This will be a great way for folks with multiple sites in one cPanel to see how a WHM account can help them with both security and performance. And it’s a great way for designers to see why WHM is a must for their business. And I’m working on getting a special guest in for that webinar too. The second webinar will be paid and we’ll dig into setting up cPanels for creating sandbox sites. This will be a great way for designers and trainers to see how much easier and safer it is to set up sites in their own cPanels compared to doing them as add-on or sub-domains under one cPanel account. The third webinar will be free, but only available for folks already in Levels 1,2 and 5 or 6 of the Webmaster Training courses. We’ll cover creating Packages and splitting sites into their own cPanels via WHM. This will be a super addition to your paid services and help you better secure accounts for clients with multiple sites. I’ll have more details for you on all the webinars as I confirm the dates. Progress continues at a rapid pace on the new Gutenberg Text Editor. But, there is starting to be some push back in the dev community over the direction this thing is going. The latest WP drama centers on how custom metaboxes will be handled. This is just one example of how the idea of Gutenberg replacing the current TinyMCE text editor all at once is going to throw some sites into chaos. In other words, if you thought the new rich Text Widget thing was a pain, wait until this hits! Here’s the thing, most folks have gotten used to WordPress as it is and a whole new interface for just creating a blog post is going to upset the cart in the most radical way it can be done. The firestorm is coming and we’re going to see who has the least tolerance for change and who can catch the vision that Matt Mullenweg has been holding and move forward to a brighter day. Now, if the changes at WordPress get you thinking about moving elsewhere, maybe Medium is not the place to go. WP Tavern has a nice article on publishers that are moving back to WordPress after giving Medium a try for a year. You can read the post for more on why, but suffice it to say that if you have a revenue generating model directly from your site, Medium is not the place to go. On another note, don’t let all those Wix ads you see everywhere tempt you either. They’ve got a long way to go before touching many of the functions that WordPress has built in or can easily be added with a popular plugin. Now that the REST API is fully in the WP core, and now that Automattic owns Woocommerce, you can bet that they will be combining the two ever closer. If you’re a developer who works with Woo, or even a site owner who uses it, you’ll want to scan this post from Torque to see what integrations are likely coming and how Woo is going to change the way it works with the data it collects for you. Contact forms can be pretty boring. That’s because styling them can be pretty hard and involve more code than you want to get into. There’s a nice post on WPMU Dev with tips and plugins and snapshots of ideas for how you can make Contact Form 7 nicer looking. Eliminating everything that’s not being used on a page helps it load faster. I made note of the link to that post in my long list of things to test to speed up a site. I’ll have more for you when I get to it. 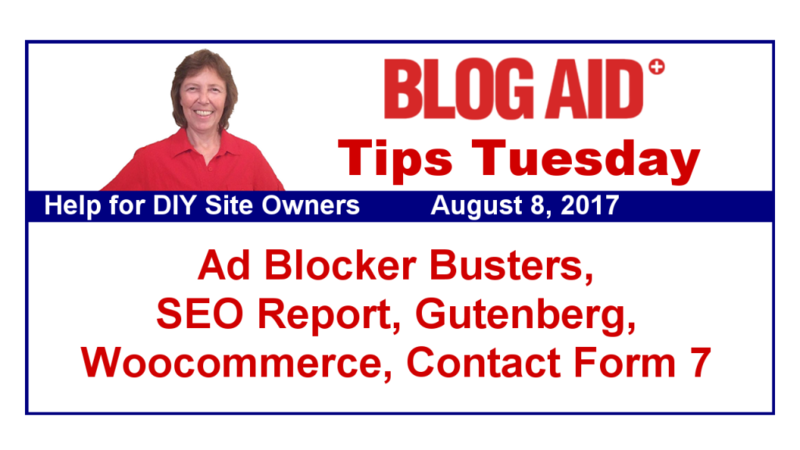 If you run ads on your site as your primary income, you’ll definitely want to see this post on WPMU Dev with several plugins to bust ad-blocker browser settings. If you use one of these, or some other service, please tell us about it in the comments here on the blog or anywhere you see this post online. You may have a whole other reason to get serious about your site speed now. Facebook announced that they are taking the speed of linked sites into consideration when deciding what posts to show in the news feed. I bet it won’t be long before other social platforms adopt this strategy too. Google already considers speed as an SEO ranking factor and it is gaining more weight all the time. If you don’t have a speedy site, your links to it are going to stop showing up anywhere. Ready for your site audit yet? I want to thank webmaster Larry Snow of Security Marketing Solutions for the heads up on this Facebook announcement. Speaking of Larry Snow, I hope you’ll subscribe to his YouTube Channel. He has a whole series of videos on how to secure your social media accounts, plus bunches of other site related tips you’ll find useful. Thanks to Barry at Search Engine Roundtable for regularly putting together monthly reports on all the things Google is changing. It’s a long list with links to more info. If you are at all serious about your SEO, you should at least scan it to get a grip on just how much Google changes every month, and see the elements that are important to your site. Nothing about SEO is set it and forget it. Zero SEO benefit to adding trust seals to your site – that’s because so many of those services like SiteLock don’t actually make your site safer, they just scan and tell you after the fact that you have malware. Embedding YouTube videos in your posts doesn’t help with rankings. What does help is a video transcript that Googlebots can read. Google adding badges to image search results on Google app for Android and mobile web. These badges describe an image if it is a recipe, video, product, or an animated GIF. Google image searches also now showing videos and recipes. Tests of auto play videos in search results. Facebook is already auto playing, and is testing whether to keep them silent or have audio on.